Attention, volcano lovers! I've got a treat for you. 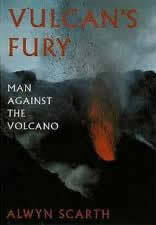 I've never met a volcano book that I didn't like (possibly because I haven't read that many volcano books), and Vulcan's Fury is no exception here. Scarth's proposition may not be brimming with volcanology breakthroughs - well, he's not a volcanologist - but he does a good job when it comes to sieving through the archives. Ah, yes. Vulcan's Fury is a bookworm's creation, not a field worker's. Some would say this casts negative light on the book's merits (Stanley Williams and his Surviving Galeras springs to mind), but I think in this particular case the author is fully excused. Vulcan's Fury deals mainly with eruptions from remote past, years or even centuries ago, and with the ways they affected people living in their vicinity. To my eye, the book is a very good primer for volcanology amateurs. It could be subtitled The Most Famous Volcanic Eruptions of All Times - it describes only the high-impact, high publicity explosions. I imagine that's partly because sources for obscure events from long ago are hard to come by, but maybe marketing reasons had something to do with the selection, too. Everyone has heard of Krakatoa or Pinatubo, Vesuvius or Mount St. Helens. The biggest, the loudest, the most murderous. A volcanic hall of fame. Truth to be told, the eruptions are nicely arranged to present the whole spectrum of volcanic risks - from ash to pyroclastic flows, from pure explosive power to killer mudflows etc. Individual characters (and preferred murder methods) of each fire mountain are beautifully emphasised. The narrative style is sometimes a bit too dramatic to my liking, but Scarth is innocent of mindless fear mongering so popular with today's media. Any minor faults that the book might suffer from are offset with fabulous pictures, printed in full colour on high quality paper. They are relevant, breathtakingly beautiful and quite numerous. Vulcan's Fury was a pleasure to read and a pleasure to look at. Highly recommendable.